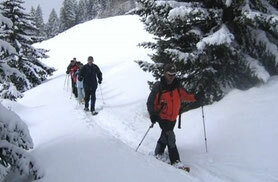 How about a lovely snowshoe hike during the day or in the evening on unknown trails? 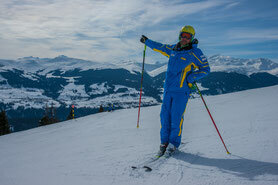 Our tour guides „whisk you away“ into a beautiful winter scenery. We offer an unforgettable hike with snowshoes or tour skis for you and your family (min. 5 (ski tour) or 8 (snowshoe tour) people) on every Wednesday or Thursday. The tours are advertised locally and therefore cannot be booked or reserved online. Come and join us and don’t forget your camera. 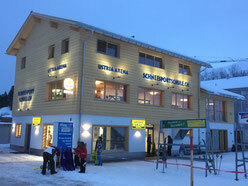 Information and registration up until the previous day at 17:00 to the office of the snow sports school. We are happy to organise these tours for private events, groups, companies, and clubs. Ask for a non-binding offer. Climb over untouched hills and experience the wonderful mountain landscape on gentle paths. With snowshoes this is probably the most enjoyable way to discover the most beautiful aspects of winter. Please contact us personally. We are happy to advice you on this subject at our office. Please come by in order to reserve a tour. Due to a minimum of 5-8 people/tour we do not offer the possibility of online-reservation. We hope for your understanding.